Personally, I usually hate having to wear a hardshell fishing coat. For the last several years, the market for these jackets has been dominated by Patagonia (with the venerable SST Jacket) and Simms (with the as-venerable Guide Jacket). Those companies set the pattern of a hooded, waist-high jacket with voluminous gusseted front pockets and various places to hang bangles. 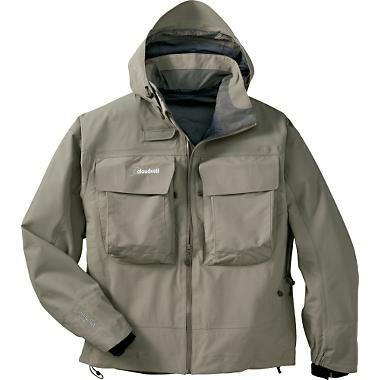 Because hardshell fishing coats are really meant to be worn in some pretty specific, tough conditions, they oftentimes aren’t all that comfortable. They have short waists (for deeper wading), tight cuffs, and they can be pretty bulky. All of those objections to the general form aside, the Cloudveil 8X Pro Jacket is a worthy addition to the ranks of these special products. Because, my complaints notwithstanding, in order to do their job in the worst possible weather (snow and ice or driving rain, often for months at a time), these coats need to be rough and tumble, and comfort is usually not the most important consideration. For example, the 8X Pro has really tight, heavy neoprene cuffs hidden inside the sleeves, with a backup velcro strap to make them even tighter. Overkill? In Georgia, certainly, but in late September on Moraine Creek in Alaska? I don’t think so – in those conditions you cannot afford to have your sleeves fill with water; it could even be a matter of life or death. When compared with the other fishing coats on the market, I think the 8X Pro is even heavier and more rugged than normal. Left alone, the jacket will almost stand up by itself; that’s how tough the material is. Yet, when I wore it in 80 degree temperatures in Atlanta’s recent Noachic downpour, I didn’t sweat, because the Gore-Tex material it’s made of is so darn breathable. I appreciate the jacket’s yoke-like collar, which distributes the weight of whatever boxes I want to put in it evenly across the shoulders. I also like the cut of the front pockets, which have a smaller external panel, making them want to lie flat when empty. The hood is easily cinched, and better yet it has a ball-cap like brim flap, which (when worn with an actual ballcap), does a good job of locking the hood in place (and also keeping the whole cap dry). This is a high-end product and it’s priced to match at $435 (but you can currently find them on sale for as low as $325 thanks to an upcoming revision). All the same, you can easily see where the money goes. Choosing a coat can be as much about fashion as function (let’s not kid ourselves), so it’s nice to see a third viable option on the market, and one which won’t require you to make any sacrifices over the Simms or Patagonia originals. Let us know your thoughts on the 8X Pro Jacket in the Comments section.